Piestany is a town about 45 minutes by car from Bratislava, which is most famous for the collection of Spa's, that make up the Spa Island. The main sight in Piestany is the Spa Island. On the island you will find a couple of different Spa's and hotels that belong to it. The most luxurious is the Thermia Palace Hotel, which was built alongside the Irma Spa, which was the first on this spot. A little bit further you will find the Napoleon Spa buildings. One to the left and one to the right. It is slightly cheaper than the Irma Spa, but it lacks the atmosphere of the old building. On the rest of the island you will find other spa's and hotels, a swimming pool, and a nice park to take walks in. Although Piestany has an airport, there are currently no passenger flights going to and from Piestany. The best option is therefor to fly to Bratislava Airport, and connect to Piestany by car, train or bus. By car, Piestany is reached in about 45 minutes on the D1 coming from Bratislava. As an alternative, or if you don't want to pay the toll for the Slovak motorways, you can take regional road 61. There is a daily connection from Bratislava to Piestany at 8.00am, carried out by Slovak Lines, which will take about 1.5 hours. A 5-minute drive from Piestany (over the bridge near to the Spa Island, and then go to the left), you will find a restaurant called Furman. It offers good food against a reasonable price, and as an extra treat you can watch the deers and some other animals that are kept on the grounds, while having lunch or dinner. Opposite the town on a hill lies restaurant Koliba, which has a nice panoramic view over the town. Besides that the food is also very nice. 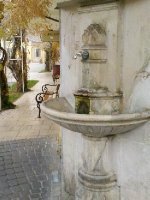 We have a comprehensive list of accommodation in Piestany searchable right here on Travellerspoint. You can use our map to quickly compare budget, mid-range or top of the range accommodation in Piestany and areas nearby. This is version 12. Last edited at 3:54 on Aug 2, 17 by sleepBot. 1 article links to this page.